This Winter, keep your shoes nice and dry. The Portland Design Works Origami Front Fender is an extremely lightweight downtube mounted guard that fits virtually any bike. Just fold the fender into shape and snap it into the quick release attachment bracket when the rain strikes. And, when the weather takes a turn for the better, you can easily pack the Origami away in your bag. Length: 370mm (14.5"). Weight: 60g. Serviceable fender with issues, but I'm a repeat buyer. I bought the Origami front and back fenders, as a temporary stopgap until I got some full fenders powder-coated blue. I never did the powder-coating, because I'm basically lazy when it comes to errands, and it just never happened. However, these fenders lasted all winter, and while the back fender works really well, the front does have an issue. 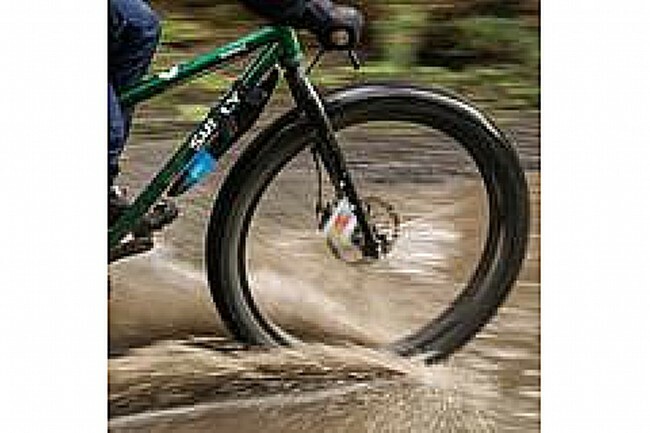 When I go fast in the rain (and in Portland, it rains a lot), the water coming off the front tire would spray out in front of me, and I'd run into it. It really needs a front-of-the-head-tube piece, to catch that. All that being said, I'm headed to Western Bikeworks today to replace this one, since I lost the one I had. I just really like how light it is, and since summer is coming, I'm only going to need it to look good, which it does. Very portable and light, easy onoff. Will still get some tarmac spray from the front tire. Great fender easy to use and lite weight keeps the mud off. I put the fender on my gravel bike, I have front and rear. This fender is pretty good, it catches most of the splash and muck. However, it does not stop all of it from spraying you. My road bike has tight clearances, so traditional fenders don't mount easily on it. This snap on fender requires a little fine adjustment and trimming to prevent contact with my front wheel when turning sharp angles, but once I dialed it in I've had no trouble. The detachable fender is a smart design, once you get the mounting bracket in a sweet spot, you might want to leave it in place throughout the winter or rainy season. Protection from road spray isn't perfect, but much better than riding in the rain with nothing up front. 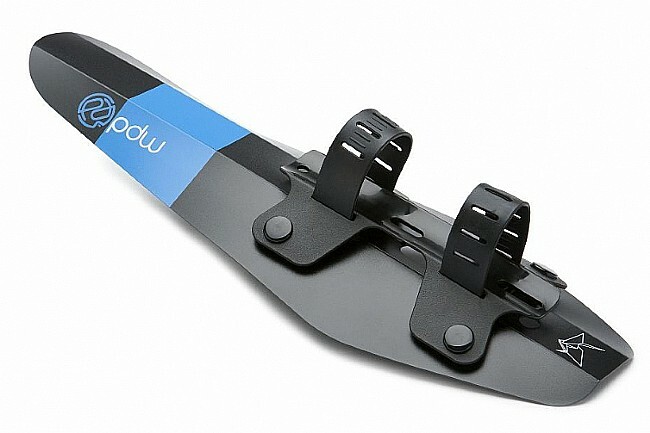 This little lightweight mudguard mounts on the down tube and can be fairly easily snapped on and off the bike once you determine the placement of the mount. I use it together with a short MuckyNutz fork fender. They overlap each other by about 12 an inch but don't rub, so it gives me the coverage a full fender would from the head tube and back, if that makes sense (not front coverage over the tire like a full fender would. Seems sturdy but yet light enough that I just leave it on the bike all the time during the winter. Mine is mounted on a gravel bike running 650b x 48mm tires. Picked this up for my CX bike that doesn't have fender mounts as I ride this bike in the wet off season and gravel rides so looking for something unobtrusive yet solid. Design is well thought out and keeps spray from my face and water bottles. Straps keep the fender snugly in place when mounted properly (watch for front wheel overlap) and looks stylish to boot. Obviousley, works only when going straight. Easy to put on & take off. I don't ride in the rain but even going thru puddles, I make sure I am going straight. Even then your feet will get wet. Almost any type of turn will get your legs & shoes wet. Kind of what you would expect since it is not attached to the forks. This has been providing me with more than adequate water spray protection. Very light weight. Works great, easy install - keep those legs clean! Amazingly simple to install, and surprisingly effective. I also like that you can simply snap it off when you need to. Great product! I was hoping to screw it on, but the bracket is to short to for my bike. I'm using one screw and one of the provided straps. Works well as it is. We bought these for my daughter who has to ride to work regardless of the weather. This has been a rainy summer so she needed fenders and rain gear given the frequent thunderstorms to and from work. These fenders have built in snaps so the fender part can unsnap and fold up. The whole thing - both front and back fenders - take up very little room in her backpack such that she can carry them all the time as she commutes. When it rains, she can deploy them in a matter of seconds. They are really effective fenders too. Really liked the ease of installation and works great. Well designed product that's easy to use. Winter wet riding for Superfly. Minimal product but Does the job!.